With the increasing complexity of imaging exams, computer-aided detection (CAD) assists radiologists as they navigate through large data sets. The software’s touted advantage—a “second set of eyes”—helps reduce reader interpretation errors and helps lay bare abnormalities that are often missed. Sanctioned by the FDA since the late 1990s, CAD initially exhibited its value in mammography. Subsequently, vendors and clinicians recognized that its benefits readily applied to other applications (eg, breast MRI) and different cancers (eg, liver, lung, colon, and prostate). “CAD algorithms combine image analysis and artificial intelligence to improve cancer detection—helping not only the less experienced radiologists, but also making experienced radiologists even better,” Filerman says. Hologic, Inc, a company specializing in women’s health, offers a range of solutions in the digital mammography CAD market. Its Cenova system accommodates the most widely used FFDM detectors and offers high quality detection algorithms on the most flexible server technologies. Its R2 ImageChecker—the first CAD system approved by the FDA for use with film-based mammography and digital mammography—is one of the most widely applied mammo CAD solutions. It helps radiologists read analog and digital mammograms and identifies regions of interest on mammography images, helping reduce the number of false-negative readings. Like other companies that first focused on mammography CAD systems, iCAD extended its know-how to breast MRI. At RSNA 2009, it highlighted its SpectraLook CAD solution developed to help radiologists better distinguish potential breast cancers while analyzing MRI results. The goal is similar to mammography CAD, but the approach is different. SpectraLook provides radiologists with diagnostic information by creating colorized images based on direct signal changes due to contrast agent influx and efflux rates, using key measures related to tumor physiology. “SpectraLook quantifies in a specific region of interest, very relevant physiological parameters,” Filerman explains. 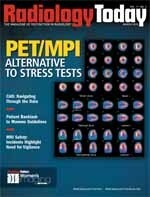 “This enables serial tracking of a lesion, measurement of preoperative and postoperative changes, and better highlights suspicious regions with a cover overlay.” This dynamic contrast enhancement (DCE) “provides very sophisticated quantification through a pharmacokinetic [PK] model, analyzing all of the images acquired at different time points as the contrast flows. Specifically, SpectraLook provides radiologists with diagnostic information by creating colorized overlays on grayscale images that are based on key physiological parameters of tumor physiology, such as permeability, extracellular volume fraction (EVF), and efflux rate. Invivo offers DynaCAD Breast for MR imaging. It’s designed to improve diagnostic confidence and procedural workflow via automatic processing. Specific tools include custom hanging protocols, multivendor viewing capabilities, configurable worklists, automatic PACS archiving that captures and standardizes reports, 2D and 3D image registration for correcting patient motion artifacts, the creation of registered subvolumes, automatic generation of subtracted images, multiplanar reformatted images, and dynamic maximum-intensity projections. Merge Healthcare, Inc offers its CADstream breast MRI product, an application designed for standardized, efficient analysis, reporting, and interventional planning. According to the company, clinicians can customize CADstream to their breast MRI workflow needs. Workflow preferences can include features such as automated 2D/3D adaptive image registration, subtraction images, multiplanar reformatting, maximum-intensity projections, volume data, diffusion analysis, and patient monitoring capabilities. According to the American Liver Foundation, liver disease is one of the 10 major causes of death in the United States, with liver cancer especially problematic. Throughout the world, 1 million cases are reported each year. But liver disease is potentially treatable via surgery or transplantation and MRI provides an integral tool for evaluation, assessment, and management. Merge Healthcare reports that more than 1 million liver MRI studies are performed each year in the United States. In response to this urgency, the company designed a specifically focused CADstream application. Like its breast solution, the liver application automates analysis and standardizes interpretation of MRI studies. According to the company, it enhances the workflow of complex studies while lowering radiology practice costs. The application’s automated features include 3D image registration, subtraction images, multiplanar reformatting, maximum-intensity projections, volume segmentation, kinetic and diffusion analyses, and patient monitoring capabilities. Meanwhile, EDDA Technology developed its IQQA-Liver application to enhance efficiency and precision in liver imaging evaluation and treatment planning. According to the company, IQQA-Liver provides a comprehensive tool set for highly automated quantitative volumetric evaluation of the liver, liver lobes and segments, hepatic lesions, and vascular structures, including arteries, portal veins, and hepatic veins from CT data. It facilitates physician evaluation of imaging data, as well as operative planning simulation of tumor resection and lobular/segmental/vascular separation/quantification/manipulation in real time. According to the American Cancer Society (ACS), lung cancer kills more Americans each year than colon, prostate, and breast cancer combined. When detected early, the five-year survival rate increases from 16% to 49%. However, only 16% of lung cancer cases are detected at the most treatable stage, according to the ACS. Chest x-rays can image early-stage lung cancer, and CAD technology is designed to facilitate that process. CAD aids the traditionally sight-read chest x-rays by enabling physicians to better identify the smallest, most understated nodules that may indicate early-stage lung cancer. Also, as with other organs and applications, it helps alleviate physicians’ workload challenges related to diagnoses. EDDA Technology’s IQQA product line includes the IQQA-Chest Enterprise. Approved by the FDA and in Europe and China, the product assists physicians in detecting these subtle nodules from digital chest x-rays. According to the company, research indicates that its solution increases detection from 63.8% to 92.7%. In November 2009, the company entered into a partnership with Japan’s Shimadzu Corporation to distribute its chest x-ray CAD technology with Shimadzu’s DR system, bolstered by Shimadzu’s worldwide sales network. The partners will also develop new applications that integrate Shimadzu’s DR with EDDA’s CAD technology. They anticipate the introduction of a new chest CAD application in the next several years. Another competitor in this niche is Riverain Medical, which boasts the first FDA premarket-approved chest x-ray CAD solution, OnGuard. The product works in conjunction with readings of standard anteroposterior/posteroanterior digital chest x-rays, providing comprehensive identification of solitary pulmonary nodules that could be early-stage lung cancer. Many radiologists adopt a wait-and-see approach that allows nodules to become larger. “But many oncologists now want to take a shot at the small nodules, which could lead to new and innovative treatment and outcome improvements,” says Hirakawa. To detect the small nodules, OnGuard deploys advanced image enhancement, feature extraction, and classification techniques (neural networks, for instance, that differentiate normal chest structures from solitary pulmonary nodules). As the company points out, clinical trials required for FDA approval determined that OnGuard detected more early-stage lung cancer than chest x-rays alone. The DICOM 3.0-compliant solution also offers PACS connectivity with immediate display on existing workstations. As in the aforementioned areas, CAD can bring value to prostate MRI. As Merge Healthcare points out, research validates the clinical use of MRI studies related to prostate cancer, as the noninvasive exam provides improved sensitivity for staging and determining disease and extends and supports more precise biopsy planning. Merge’s prostate-specific CADstream application customizes how clinicians evaluate the studies. It offers general study processing features such as automated 2D/3D adaptive image registration, subtraction images, multiplanar reformatting, maximum-intensity projections, alignment of T1 and T2 images, color overlays, and diffusion analysis. Similarly, Invivo offers its DynaCAD for Prostate solution, a digital imaging system characterized by a comprehensive set of advanced visualization tools that enable clinicians to perform real-time image analysis of prostate MRI studies. The product, which boasts automated, computer-guided interventional software (DynaLOC), offers an MR image analysis system, rapid processing and management of large data sets, custom hanging protocols that open ready to read, and extensive reports. Also venturing into this territory is iCAD, with its VividLook MRI prostate analysis solution. Similar to SpectraLook, VividLook provides more diagnostic information by utilizing all time points and creating colorized images based on signal changes defined by tumor physiology, according to the company. The postprocessing software solution provides reliable visualization of the presence and pattern of contrast-induced MRI images in the prostate, helping clinicians distinguish between benign and malignant lesions. Both products provide permeability and extracellular volume fraction values, which are key parameters for radiologists as they study specific regions, “particularly for the prostate, where quantification is so important,” says Filerman. “MRI is becoming increasingly important for prostate images, as there is a large, growing population of patients in active surveillance. MRI provides the ‘watchful waiting’ element, while CAD provides quantification and highlights suspicious regions via color overlay,” he adds. In 2009, 50,000 deaths were attributed to colon cancer, but it’s a relatively slow-growing cancer and, thus, easily treatable early on. “Colon cancer most often manifests first in the form of a polyp, and if you can identify, locate, and remove the polyp, then you effectively decrease the chances a patient will ever develop colon cancer,” says Filerman. Looking ahead, Filerman sees two significant trends emerging. First, for mammography and CT colonography, CAD systems are continuously being improved to enhance sensitivity and reduce the number of false positives. “At RSNA, we announced results of a reader study we performed that revealed a statistically significant improvement in detection of potential polyps,” he says. Another trend, involving MRI, is the quantification CAD extends to therapy response monitoring. It comes down to knowing when, where, and how to intervene, and CAD can provide answers to those questions. During the next five years, prostate MRI will likely become more widespread while quantification through CAD will likely coincide with that growth, Filerman adds. Finally, Bickford addresses questions related to the larger picture. “There are a couple schools of thought,” he says. “One feels that CAD will eventually replace the physician in reading basic exams. The other feels that CAD products will only continue facilitating the physician’s job.” But his feeling is that “CAD is will be a tool that assists physicians in their diagnoses” because it’s designed to perform the mundane analysis that will enable physicians to cut to the chase. “CAD allows physicians to deal with enormous data sets more efficiently. Essentially, it makes their job easier and, in turn, makes them more accurate. But it won’t replace what they do,” he says.